“Has anyone seen my phone?” When was the last time you asked this question with a panic-stricken voice? Today’s mobile phones are jam-packed with incredible amounts of vital personal information, including bank account information, credit card details, usernames and passwords of important online services like email accounts, Facebook account etc. Your phone may even store your friends’ and family’s personal information. Losing your Android Phone is like losing your purse with your laptop inside of it. Then, when it comes to lost cell phones, the phone companies want to charge an arm and a leg for a replacement, and the police seem to have better things to do with their time than chase down everyone’s lost cell phones. Nobody would like to go through this feeling of loosing a mobile phone, so while you are reading this article, grab your Android phone or Android device and get ready to download some Android apps to be prepared for the worst in advance. Where’s My Droid? What is the first thing that everyone does when they lose their smartphone? Of course, they pick up another phone and dial their cell phone number, only to vaguely remember that the last time they used it, the ringer was off. This is when Where’s My Droid Android app comes in for the rescue! When you lose your phone, text your cell number with the “attention” word from another phone and the app will turn up the volume on your Android so you can hear it ring! 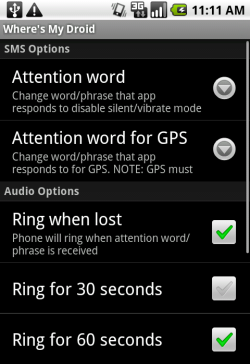 So, simply download Where’s My Droid Android app and install it, select the attention words, and then set the ring time length just in case you misplace your phone. If you can’t find your lost Android phone with the Where’s My Droid app, then it might be actually stolen. The first thing to do now is to block the SIM of your Android phone using its IMEI number. You can also contact police or your mobile phone service provider to help you trace, track and recover your Android Mobile phone using its IMEI number. Lookout Mobile Security for Android is an Android app which is full of great security features, including a cell phone locator for when you lose your Android. Let’s talk about the phone locator service first. Download, install and register lookup with your email account for FREE. There are two techniques that Lookout offers to help you find your lost Android phone. The first one is a GPS locator and the second is an alarm that screams, both of which can be set up to either locate or go off remotely, either from another cell phone or a computer. The GPS locator is awesome, because it will return emails to your computer with the exact GPS location of your phone. Lookout also offers anti-malware and antivirus protection. Just like your have an antivirus software on your Windows computer, you should always have a good antivirus app installed on your Android Mobile Phone, and lookout is a good choice. They also provide a back-up and restore or security scan. Plan B is another fabulous Android app offered by Lookout is called Plan B. This is the last-resort for those who never installed a security app, but have found themselves in that scary position of losing their Android phone. Plan B can be remotely installed from your PC using an Internet connection. 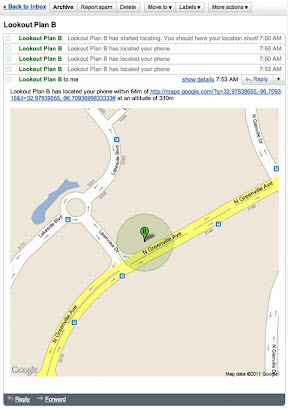 Plan B uses the same GPS feature that the regular Lookout Mobile Security app provides. You can find Plan B app here. You can also check with your cell phone service provider to see if they offer any apps to help you find your lost or stolen Android phone. Both Verizon and T-Mobile offer apps for Androids that are created to secure mobile devices, as well as find them. If you are in India, you can also find the approximate location of your Android phone by using your phone number. You can also make a missed call on your phone using any other Android phone, and if the person who has your phone right now calls back, you can find location of phone by phone number. Note that this will not trace your Android phone to its exact location but will just give you a rough idea. You must use the Lookout and Plan B Android apps to find the exact location of your Android phone. Do let us know if you know about any other way to trace, track or recover a lost or stolen Android Mobile phone and we will update this post.